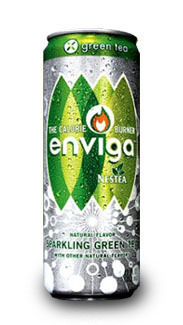 Marketed as a "calorie-burning" beverage, Enviga is a sparkling green tea, a proprietary blend of green tea, caffeine and calcium from the producers of Nestea. Enviga contains 90mg of EGCG (Epigallocatechin galate, a powerful anti-oxidant) and 20% of the daily recommended intake for calcium. Enviga claims a "negative calorie effect" by effectively burning off more calories than the can contains (5 cal). The clinical study conducted by Nestle found that study participants drinking 3 cans of Enviga per day burned on average 106 calories more than those that were given a placebo drink instead. Enviga is currently only available in New York, New Jersey and Philadelphia, but should be available nationally in 2007.